1. 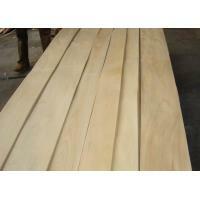 Russia birch veneer also called white birch veneer, china birch veneer and Chinese maple veneer. 2. Size: 1200mm-2800mm x 90mm and up x 0.5mm. 4. Cut Size: Sliced Cut. 6. It can be used in the surface of the furniture, door, plywood, MDF, chipboard and block board; interior decoration, etc. Russia birch veneer, also called white birch veneer and Chinese maple veneer, originated from northeast China and irkutsk of Russia, is a hardwood veneer mainly used for furniture surface making and interior decoration. China birch veneer has a nice grains with uniform light pink color.The most popular grain form of china birch veneer is crown cut. The better logs display a uniform cathedral crown with clean. The annual growth rings are often lightly defined and give the veneer a unobvious look. In veneers, the grain and structure of china birch veneer with cheaper cost is very similar to American maple veneer, which makes it one of more attractive hardwood veneers. Natural russia birch veneer is a product applied to the surface of the furniture to give it the appearance of being made of solid russia birch lumber. It is also commonly used in surface of the door, also know as plywood, MDF, chipboard and block board and interior decoration, etc. 1. Natural wood veneer, pro environment. 2. Uniform light pink color with nice grain. 3. Cheaper price with good structure. 4. Stable supply situation with fast delivery date. 5. The grain and structure is similar to American maple veneer.